Its this time of the year again when Filipino Film Makers, producers, actors, directors and the movie goers are all excited to watch the entries of the said star studded Festival in the country. Millions of movie goers line up in different malls to either watch their favorite actors and actresses or to watch all of the entry. I wont be saying one movie is better than the other. This is not what the article is all about. I would be talking much more on what I thought in general about the movies presented for this years Metro Manila Film Festival 2013. In general, today's Metro Manila Film Festival runs smoothly and definitely a success. Families spend a portion of their money to support the said festival. I like the idea that at least once a year they closed all cinemas across the archipelago to give way to all entries to be shown nationwide starting December 25 until somehow first week of January. For the opening day last December 25, My Little Bossing definitely rocked the ticket gross sales and topped the chart. Even before the opening I already think that My Little Bossing would be the highest grossing film for this years Metro Manila Film Festival. As I watched the movie, I think Ryza Mae "Aling Maliit" Dizon definitely is the sailor of the show. She definitely outshine her partner James "Bimby" Aquino (as expected, because this is Bimby's first appearance in movie). Bimby and Ryzza Mae will now hold the highest gross film for Day 1 outshining last years highest gross film Sisterakas.This proves that Kris Aquino (starrer of My Little Bossing) still is the Queen of All Media and Blockbuster Queen as I always say she can sell even the stone in Metro Manila and Vic Sotto still is the king of highest grossing films of Metro Manila as he never fails to be part of the TOP 3 Highest Grossing Film and don't underestimate Ryzza Mae "Aling Maliit" because she continues to prove that she can sell a movie and a talk show. My final verdict for the movie is definitely a comedy of good taste and class. Aling Maliit Ryzza Mae Dizon and Aiza Seguera is the flag bearer of the said movie. The chemistry of all the actors and actresses of the movie in deed shines all throughout. I truly recommend this movie for children and or for the whole family. Second highest grossing film for today's Metro Manila Film Festival is as I expect is Vice Ganda's Girl Boy Bakla Tomboy. Vice Ganda is fully supported by the grass roots because of the kind of joke he uses which is very visible in the movie. Maricel Soriano still proves that she is still on the limelight after she takes home the Best Actress Award. I truly recommend this movie to moviegoers above 18 years old because of the kind of joke it has transpired in the movie. Horor movie still has some spot to Filipino movie goers as transpired by the Kathryn Bernardo and Daniel Padilla tandem in Pagpag: Siyam na Buhay as they still holds the number 3 spot in top grossing films. I watched the movie because I am very interested in Filipino culture. It is believe that after visiting a burial or wake one should go somewhere and "shake off" and clean himself or herself to ward off the spirit of the the dead and will not follow him or her before heading home. I don't know why Horror movies are shown during Christmas season. Again Eugene Dominggo paves her way with her comedy stint and amazed her audience and fans in her Metro Manila Film Festival Entry Kimmy Dora and Kiyemeng Prequel. Her comedy styles never fails her audience and proves that Kimmy Dora can still sell as she is part of the Top 4 highest grossing films. 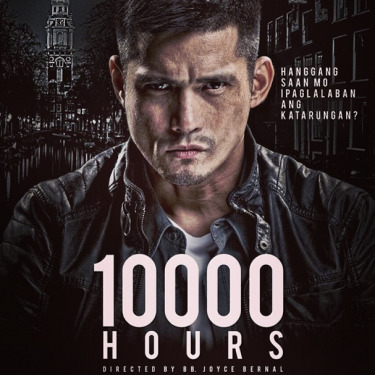 No Doubt, Robin Padilla's 10,000 Hours definitely rocks the Festival as it bags almost all the awards. Robin Padilla then and again paves his way to the BEST ACTOR awards. It is a movie that will definitely revotionalize the action drama stints. I would say that this is so far the best of Robin Padilla's action-drama movie he ever starred into. One thing that turns me off is the idea that it is again based on a political figure. It could be used as again political advertisement to the politician they support. It doesn't wave product endorsement but it has shown a definite political advertisement which I am not fan of. The cinematography, acting, and directing is what I think that makes it really good. So far, for most of the movies I've watched I believe that there are entries that is not supposed to be there but the winner definitely deserves their award (though Pedro Calungsod movie should have an award as well). Another thing that I have observed, most of the movies contains commercial product thus I call it a commercial movies or advertisement drama or product placement. It is evident to most movies that they always definitely made sure to add the products that they are endorsing at some point it became part of the movie attraction. I am not a big fan of such movie and I discourage such product endorsing on movies and should focus more on quality. Movie goers watch the movie because they wanted to be entertained and not watched the product the actors and actresses they endorsed. Again, the Metro Manila Film Festival should showcase the best of the best Filipino Movies and not just a local flare. I am expecting that entries should way better or at par to their New Wave counterparts. The Metro Manila Film Festival should stands in their vision to promote the best of Filipino talents and not an avenue to promote political personalities, mobile applications, bath soap, pancit canton, laundry detergents among others. This should be an avenue of businessmen to flaunt their products and sell it to their audience. Films should be an avenue to entertain while ingesting values and characters and or very good story line, plot and acting. New Wave Best Actors: Wilfredo Layug, Bor Ocampo, Bambalito Lacap for "Dukit"